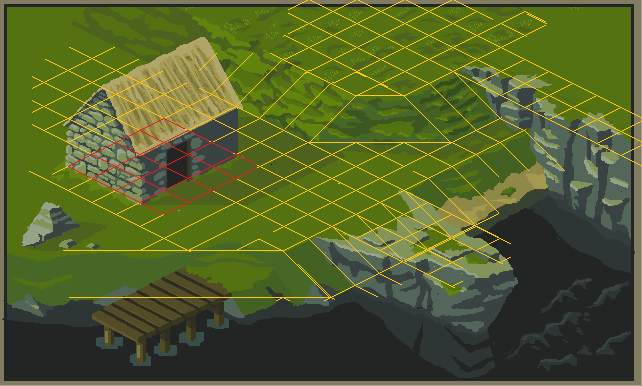 Since only the house and pier can be obviously aligned to the grid so far, the perspective looks off, esp on the roof. If not strictly necessary, I'd consider cheating. For composition reasons, I'd prefer a light source at upper right, so the lit side of the house faces inward. The water is unrealistically dark, looks like a floating island in outer space. The sky should reflect in it, it can't be dark because of the soft house shadow; it would also have some degree of transparency, at least at the most shallow. Not sure I agree with the dark water being too dark unless this isn't a night-fall scene (it reads as just around sunset, when most everything is covered in shadow and the faint glow of the orange sun behind the horizon.) If that's the intent, then I think it looks fairly spot-on, although you might want to consider some hint of speculars on the waves, since I doubt you'd be able to see that deep into the water at that time of day. Finally, the perspective on your house is bizarre (the roof to the rightmost side of the image stands out the most), and it doesn't really read as proper iso to me. I would consider cheating on that portion of the house if you're determined to have the base aligned to the grid. 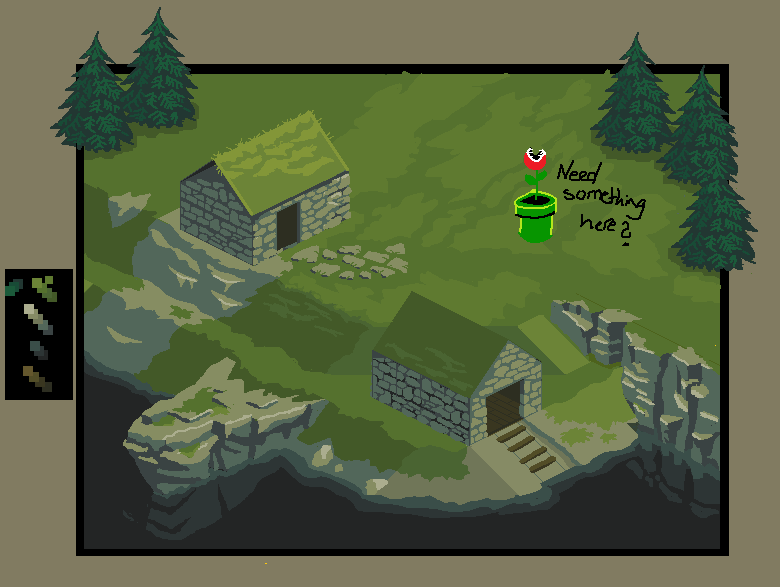 You need at least some sense of diminishing perspective to keep that roof from looking way too pointy at the top-right. Perhaps it's that little bit that seems to hang off to the bottom-right corner portion of the roof that's ruining the illusion. Fix that first to see if it helps. Otherwise you might need to bring in the end of the roof a little depth-wise. I instantly knew it was inspired by Vagrant's piece.. I must be an astute viewer .. and cool that you linked it. I think the main reason is the way you made the hill formation so similarly. I also agree that the barn or house looks a bit off. somehow it reads as if at the peak it curves inward even. not sure how u want the grass to look but simply using the texture to rough up the edges between blocks of shade is a good start. Thanks, guys! Very encouraging, you're giving me the feels! I tried to tone down the colours in this version, so that it doesn't look like a sunny day. I wanted this to be a cloudy day. But I think I need a bit more contrast still. Thoughts? - Yeah, I definitely want to keep this Iso. But I realize that one building isn't enough to show that this is actually intended to be iso, so I've introduced another one. Works well with what I had in mind anyway. - I was kind of working with the grid before, but I kind of abandoned it after a while. I'm following it more strictly this time. 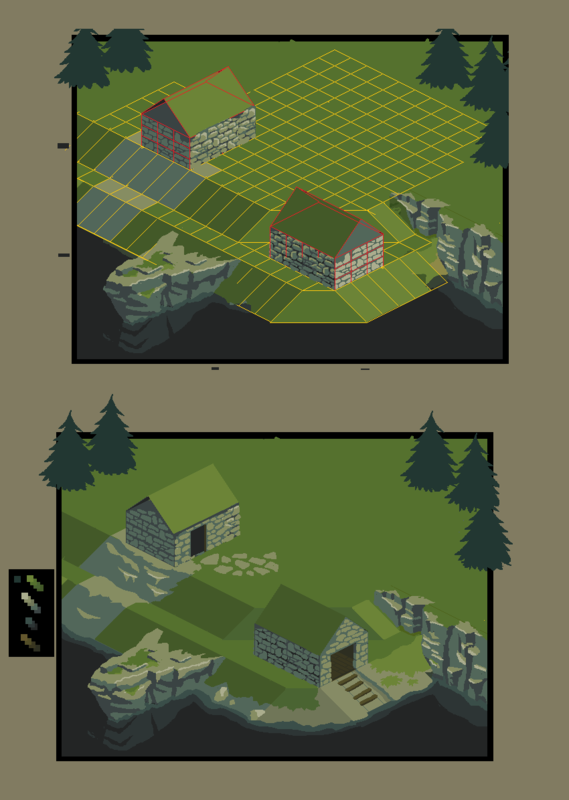 - Changed the composition, good call about the light source vs the main point of interest. It's not the short wall. - I definitely want the waters to be dark, like the Norwegian coast. But yeah, I may have gone too far. 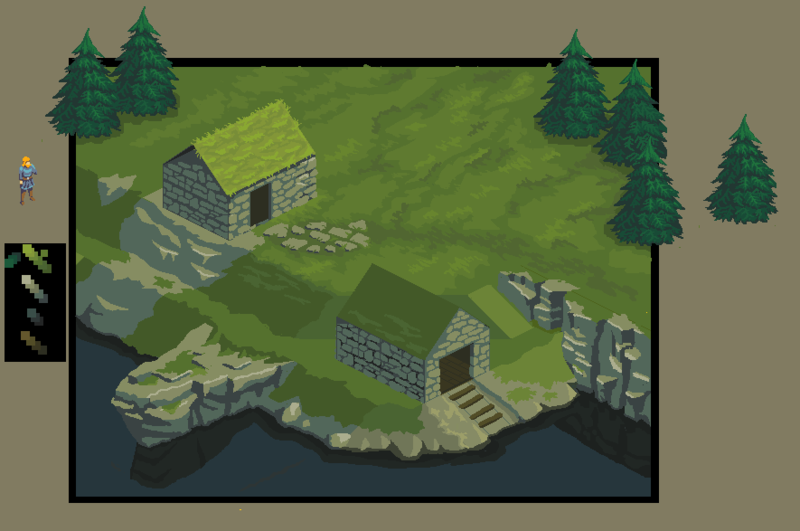 I'll tweak the colours a bit more as I progress, start to look for some references for the water. I will also work on the transparency! - The shadow was more of an after thought, and a mistake. I don't want this to be dusk or dawn, I'd like this to be around noon on a grey day. - Thank you, I'll try to adjust the colours to match the time of day I had in mind. - I'll also work on the roof, keeping your criticism in mind. Hopefully, I'll be able to show some progress there in my next version. @ ||||: Hah, well done. @ Decroded: Cheers! I'll need to think about the grass, as I want to eventually get around to animating it, so that it's constantly bending and swaying in the wind. Would be cool if grass animated in a wave across the scene and u could see it russel leaves on trees as wind hit trees. A cycle of gentle wind followed by a stronger sustained gust. The way you drew the lighter grass in your newest version gives the impression of breaking perspective. Its because the shapes you drew are vaguely rectangular, but are at an angle that doesnt reinforce the iso projection. @Mr. Fahrenheit: Good call. Thanks! In my latest version, I've gone and reversed the colours in the waters, so that the reflections from land are actually dark compared to the water which is reflecting the clouded sky above. This seems more consistent with pictures I've looked at for references. Note: I am aware that I can't have a pristine ocean surface and perfectly vertical trees when the grass looks like there's a hurricane going on. Will add wind to trees and water later. I liked the yellow-er color you used for the roof before, it introduced a nice splash of color into the scene, but the green roof just sort of looks weird to me.